Over the years, I have had numerous e-mails from single parents, both men and women, asking me whether or not they should take their ex back. That seems to be the number one question on people's minds and I'm glad to be able to tell them that it's a simple issue - the answer is "NO." When parents split, it is a devastating experience for whichever partner didn't want it and, in most cases, for both. I doubt that very many people who leave their families actually envision what divorce is going to mean. If immaturity was an issue, you can pretty much bet that they'll eventually grow up. If the grass isn't greener, they may want to get back over the fence. Sometimes, the problem is a little too much maturity. "Middle age crazy" strikes and the afflicted spouse cannot be happy buying a new sports car. Frankly, that works for me. 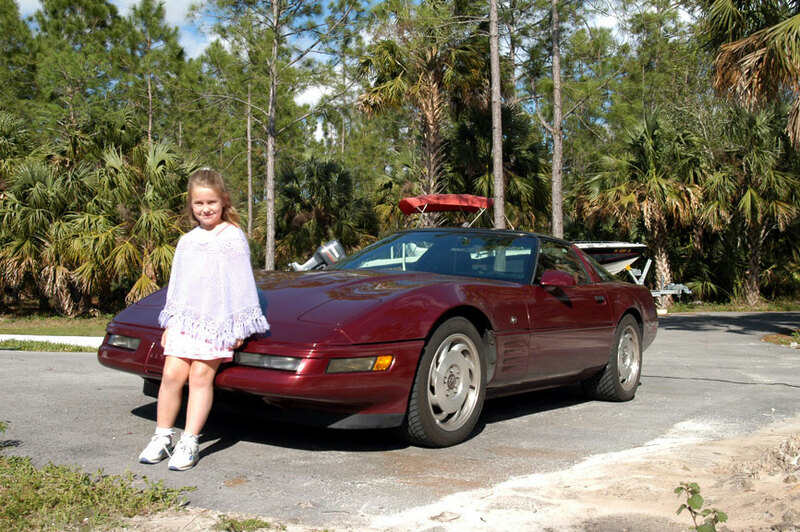 Nothing like cruising around with my cute little young blonde in our 'Vette! For some that's not enough. Confronted with the fact that they are getting older, an illicit affair makes them feel like they've recaptured their youth. I've been a detective for a lot of years and I have seen it dozens of times. It's an insanity that carries with it considerable pain as it passes, but in some cases, the illicit affair goes to their head and they abandon life, love and family for the promise of something exciting and new. When the novelty wears off, and hoochie momma starts looking around for someone her age, the balding fat bad boy with the pitiful combover may want to come home. The fact is, the kind of people who play "home wrecker" generally make lousy partners in life and, unless they are "dumb as a box of rocks," they don't trust the person who left their home and children for them. The cheating spouse "relationship" almost always falls apart. That isn't the sort of foundation you can build on. There are other problems that go with it. When you abandon your family, you lose your friends too. Sure - there are always those who support and encourage this sort of thing, but they're not the people who matter. Real people have real values - sooner or later, dreams and infatuation can evaporate and somebody may want to come home. So it's over, you won - now you, they and everyone knows that, "You da man - or woman." The question is, "Do you go ahead and take them back?" If you're asking me, it's a question I can answer with an unqualified "NO." It's wonderful to be so smart, and know everything! Brothers and Sisters, the truth is that I don't need to be all that smart to know that if you're asking a total stranger on the Internet whether to marry someone, and make them a part of your life and your family, the answer has got to be, "no." The answer has got to be "no" because, if you loved them, they loved you, and life made it possible for you to put your life and your family back together again, you wouldn't be asking me. I do think you'd have to ask yourself some questions first, but I'm not sure that I know what those questions are, let alone the answers. Do you know what went wrong in your relationship? Did your ex betray the perfect spouse? If not, is the problem, or problems, fixed? Why do they want to come back? Did they set out on a cruise and find the winds and waves a little rough - are you just, "any port in the storm" that they are going to leave when the sun comes out? Why are you considering it? Did they set out and leave you to deal with winds and waves that are a bit too rough for you - are they just, "any port in the storm" that looks like your best option? Do you love them, do they love you - did either of you ever? How exactly do you define "love" anyway? I don't profess to know for sure, and I don't think I'd propose to proffer my personal definition if I did. I will share with you a definition that I believe to be as good as any - and probably as good as it gets. It has endured for a couple of thousand years. Let's look at that first sentence - particularly the part about pride. Is this about your wounded pride and battered ego? Lord knows that nothing in life hurts worse than having to accept that someone you love, and have loved, cares only for someone else - words on paper cannot begin to conjure up that pain. Do you need to prove to yourself, them, and whomever else that you, "won?" Do you keep records of wrongs?. Have you got a little book in your head where every evil, hurtful, miserable thing that has gone on between you has been dutifully recorded? Could you pitch it - really pitch it, erase it from your heart and mind. Can you expunge history, set out with a clean slate and go forward without looking back - ever? How do you feel? In your heart of hearts can you be honest with yourself? Are you gloating that things didn't work out for them, delighting in their failures and rejoicing in their pain - or did you hurt with them, and for them? Do you trust them? I'd pause long and look hard at that question if I were you. Realistically, can you hope to join with this person, cherish all that they are, pick up the pieces and see life through with them? I don't know, I don't have a way to to know - only you can assess that. All I can do is offer you a clue. Whether he was divinely inspired, blessed with personal experience, or gifted with uncommonly intuitive perception, I personally believe that Paul had a real clear understanding of what love really is, and a wonderful way with words. I think his definition carries with it the clue that you need.
" . . . Love forever perseveres." Real people make real mistakes, and loving a person with all your heart and soul doesn't guarantee that you can't hurt them - or they you. My question to you is, did the gloves come off? Did they ever really try to destroy you - or you them? Hostility and discord aside, can you say that in spite of everything and thru it all, there has never been hate between you - for even a moment? Throughout it all, have you missed them - every day? When wonderful things happened between you and your children, did you feel satisfaction that whatever they were doing, and with whomever they were doing it, at least they were missing out on the good stuff - or did every wonderful moment bring with it a sadness that they missed it? When good things happened for you, when life was good and success was yours, did you feel vindicated? Did you feel like a winner that you had something they did not, or did you feel a profound sense of loss that you couldn't share it with them? When life fell their way did you resent it, or have you always wished them well? When bad things happened, when life wasn't so good, when things around you looked bad, did you hope they would never know because the thought of them gloating at your misfortune was worse than you could bear - or did you miss the source of strength and support that previously carried you thru? Have you despised them for the wicked things they've done, and gloried in the loss of their self respect, or have your contributions to this fiasco kept you awake nights worrying that they may be unable to forgive themselves for their failures in the wake of whatever has happened between you? Have you ever seen that perfect sunset without feeling completely empty inside? No matter what your answers are, you really need to know theirs. All the love in the world can be like playing the air guitar if it's only one way. No matter how you feel, this life is all the life you're going to get - it can come time to move on. Sometimes, the young soldier who cuts and runs the first time he feels fear finds that there are worse things than dying. Sometimes, the coward who comes back is the one guy you can count on never to run again. Maybe you completely "lost it" together; maybe there's plenty of guilt and shame to go around. Are you two people more concerned with the other's pain than your own, each so disgusted with your own failures that you have no issue with theirs, both disbelieving that you somehow managed to wreck the best thing that ever happened to you, and desperate to turn back a clock that only moves one way? If so, "Just turn around, life is that way, you're looking on the wrong direction." If not - and probably not, or you wouldn't care what anyone in the whole damn world thinks - the answer for you is , "NO"